A wedding planner is only as good as their client list. The short-term, non-repeating nature of the industry means a wedding planner must have a constant stream of potential new customers waiting in the wings. The Internet has made this golden dream more possible than ever before - if an event planner uses the tools at their disposal effectively. One of the most powerful tools for any event planning business is social media, giving unprecedented outreach and instant contact with your customer base. Knowing how to use social media to find wedding planning jobs can take your practice to the next level if you do it right. The first step in how to use social media to find wedding planning jobs is knowing where to look. 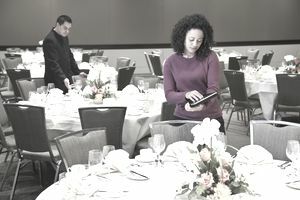 Facebook, Twitter, Pinterest, and even LinkedIn can all be useful sources of event planner jobs, helping you find couples in need of expert guidance for their big day. The most powerful tool in using social media is the ability to monitor what people are saying about a subject. Use a service like Hootsuite and make search templates, following searches like #weddingplanner or #weddinghelp. Narrow your search to your region. You’re most likely to only work with clients in person, so streamline your searches for maximum efficiency. If This, Then That (ifttt.com) is an amazingly powerful tool that is deceptively simple to use. It is based on ‘recipes’, where one action follows another. Some ideas for useful recipes might be “If someone tweets about #weddingplanner and #Texas, their name will be added to a Google Spreadsheet." This can yield a prospective client list in practically no time! Ifttt.com can also be used to automate messages to people posting messages on certain wedding-related topics. Just remember to make sure those messages are not robotic or artificial. Wedding planning is based on a hands-on, personal touch. Many 21st-century wedding parties use group Pinterest boards to share dress ideas, hairstyles, or floral arrangements. Use specific, targeted hashtags to find couples working in your region who are currently in the planning process. Repinning posts on wedding-related topics is a great way to raise awareness of your wedding planning business without the hard sell of cold calls. The same tactic can be used for Twitter and Facebook. ﻿Going viral is the white whale of the social media marketer. There’s no telling which topics will take, but hashtag campaigns implemented in a strategic fashion is a step in the right direction. Ask questions about #floralarrangements or post pictures of #dreamweddings. Beautiful, inspiring photo content is the currency of social media, frequently traded among friends and followers. Using photos and infographics in conjunction with hashtags is a surefire way to extend your outreach! Competitive Intelligence is paying attention to what your competition is doing and saying. It’s somewhat shady, but all is fair in love and wedding planning and chances are, your competition wouldn’t hesitate to snipe a client from you. You can create search and social listening campaigns for your competition as easily as your own content. Pay attention for signs of discontent, and have your own conversation on the side. Follow hotels, banquet halls, community centers, and even churches in your area and pay attention to who they’re talking to. A wedding party might be inquiring about rates and availability that might be in need of your services. Post and tweet photos of the projects you’re working on, comments from satisfied customers, and interesting news and trends in your industry. Your social media will become known as a trusted source of wedding inspiration and people will follow you without asking. This will add to your RTs, shares, and engagement, which in turn, will lead to new work.